Watch the video or read the post below! The first thing you need to do is get super clear on your brand. That's your vision, your personality, and what makes you different from everyone else doing the same thing as you. The next thing that you want to have figured it out before you DIY your website is your brand visuals. The easiest thing you can do is create a brand board. 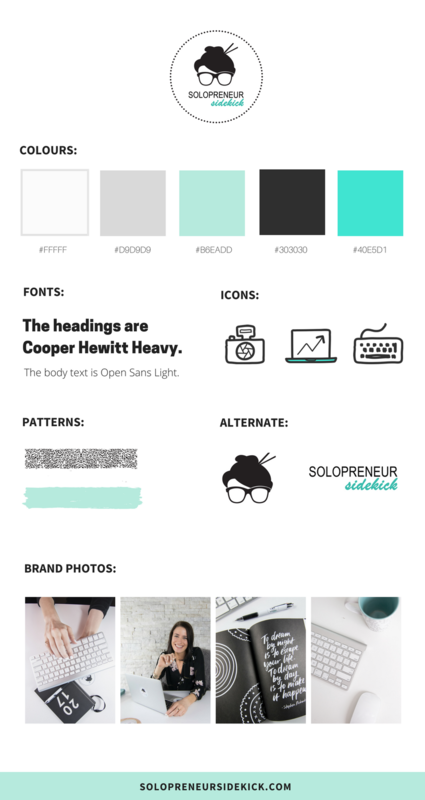 This is a great visual to have and will include your logo, your color palette, your fonts and more. Depending on what you do, this could either be a small or a big job. For example, if you're a wedding photographer, you're going to have tons of images and you need to choose your favourites to use on your website. Keep in mind that you want to convey one particular style. Even though you've probably shot all different kinds of weddings, make sure that there's consistency in the images that you show so that you attract more of that type of client. If you don't have any images yet, don't worry. You don't need to go out and book a professional photo-shoot yet. I mean those are really fun, so if you want to do that, absolutely go for it! It will help your website look more custom. But if you're just getting started, there are great sites where you can find really natural, non-stock-photo-looking, really great photos that you can use on your site. A few of my favourites are pexels.com and unsplash.com. So definitely give those a try. You're going to want to plan out what pages you need. There's nothing worse than trying to DIY your website and just staring at a blank page. So plan this out ahead of time and even write out as much of your content as you can. And finally you need to have planned out your packages already. You need to know what it is that you're going to offer, what the price point is, and what is included in all of these packages. Make sure that you figure that out ahead of time so that you're not stuck when you're DIYing your website on the actual content and on your packages. Those are the five things that you need to do before you DIY your website. If you liked this video, make sure to give it a thumbs up and hit subscribe so that you don't miss another video, and I'll see you guys soon.